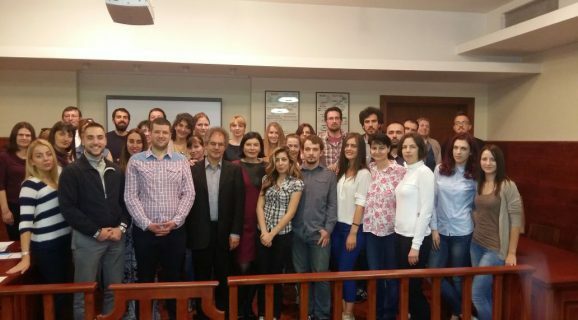 In the period of May 23-26, 2016 the University of Belgrade Faculty of Law had a pleasure of hosting Prof. Dr. Yuri Stoyanov from SOAS University of London, Near and Middle East Department who taught the course on Religious and Cultural Heritage Protection in Europe and European Integration. The course dealt with issues of religious heritage, religious pluralism and multiculturalism in Europe, new EU heritage policies of cultural integration and Europeanization, present and evolving threats to religious heritage and current European political and legal initiatives for the protection of cultural and religious heritage. Although, in principle, the course was organized for students of Master in European Integration, many other students, both from the Faculty of Law, and from the University of Belgrade in general took part in this high quality course.